NORTH Sea helicopter company Bristow said yesterday it was continuing to lead safety innovation in the aviation industry. It has announced a multimillion-pound investment in the development and fitting of the latest traffic collision avoidance system in its helicopter fleet. The company has started commercial operations with a TCAS2-equipped Sikorsky S92, operating for the first time on a flight to an offshore installation from Scatsta, in Shetland. Plans are in place for all seven of its UK-based S92 helicopters – six at Scatsta and one in Aberdeen – to have TCAS2 installed by the end of next month. TCAS2 uses onboard systems to detect other aircraft in the area that may represent a collision risk. The system then directs the crew to take avoidance action which is co-ordinated to ensure maximum clearance between the aircraft. Mike Imlach, Bristow’s director of European operations, said: “Bristow is responsible for many of the safety advancements and modifications that are now taken for granted as standard equipment on offshore helicopters worldwide such as IHUMS (Integrated health and usage monitoring system), HFDM (helicopter flight data monitoring systems), automatic flotation deployment and externally stowed liferaft systems. “Our dedication to developing pioneering systems is a result of Bristow’s commitment to ensuring the highest standards of flight safety. 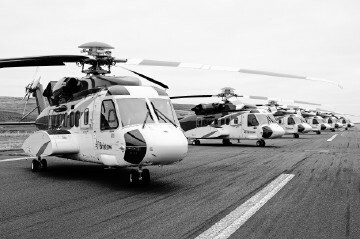 All 50 helicopters that Bristow has in Europe will carry the TCAS2 system within three years. Rival Bond is already using the TCAS2 system on its AS332L2 aircraft in the North Sea. The firm said it had made the system available to other operators to increase safety across the industry.